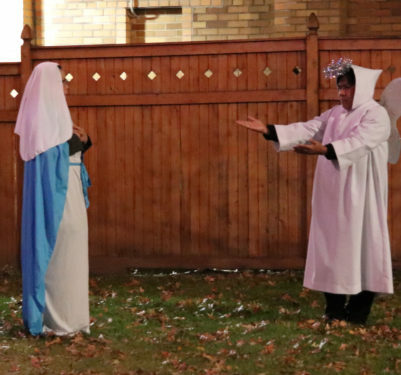 The Elmhurst parish heralded the beginning of Advent with a Christmas pageant. 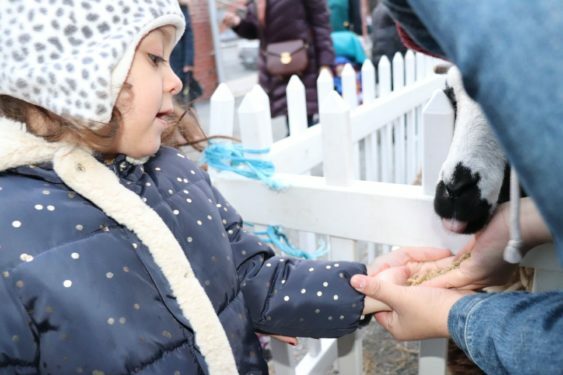 Live animals, school children and the many parish ministries worked together to invite all to make room in their hearts for Jesus to be born. Father Mirek Podymniak, O.F.M. 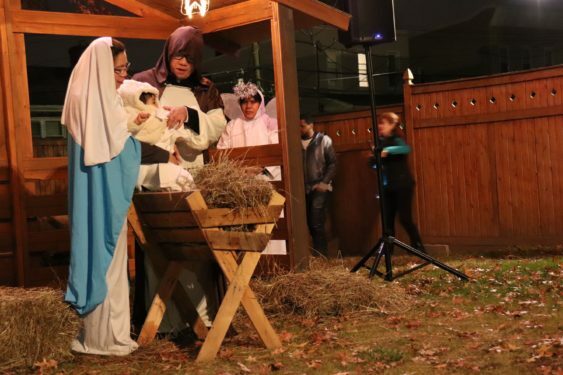 Conv., pastor, said the event was truly a parish family project. Every group had a job and it all came together under the stars and a nearly full moon in the parish yard. 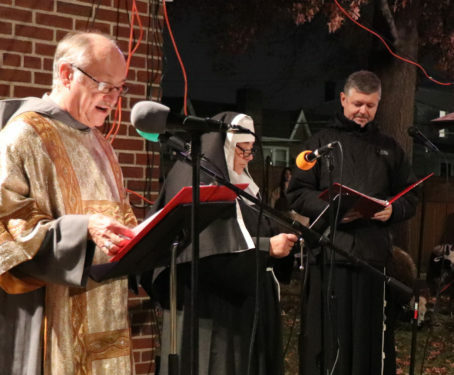 During his opening remarks, Father Podymniak explained that it was St. Francis, the founder of his order, who is said to have displayed the first Nativity scene. So he introduced Father Raphael Zwolenkiewicz, O.F.M. Conv., as St. Francis who would be narrating the Nativity story together with St. Clare, played by Linda Gatti. 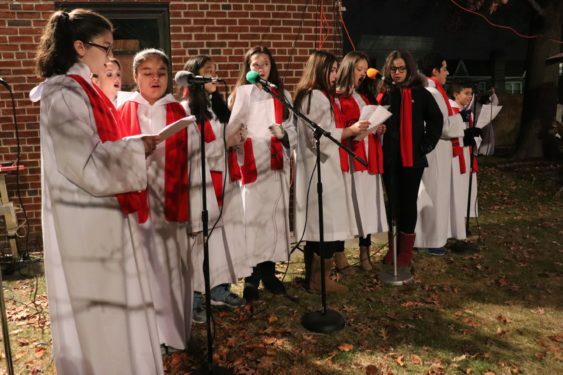 A parish Filipino family played the Holy Family, school children had the role of guards and the children’s choir sang. The angels heralded the newborn king and the star shined bright. After the Three Kings presented their gifts to the Savior, they offered chocolate gold coins to all the children. Afterwards everyone was invited to warm up with hot chocolate and cookies. It has been Gatti’s dream to have a Christmas pageant like this ever since she started working at St. Adalbert. Now the event is in its third year. 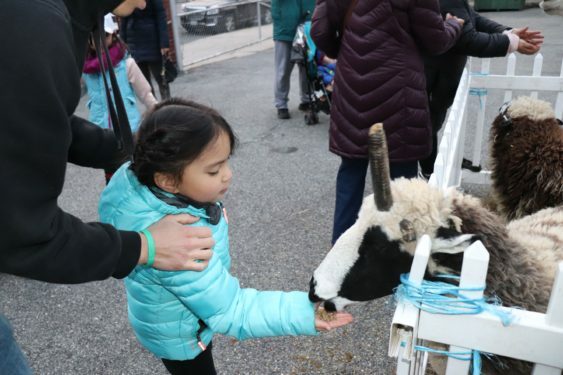 She remembers live animals walking down the aisle for Midnight Mass in her childhood parish of St. Francis of Assisi in Manhattan. 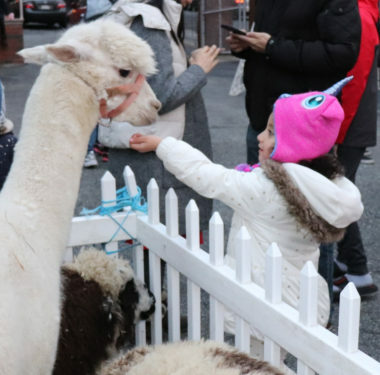 She said the animals made Christmas feel more real to her and inspired such awe in her that she carried the memory with her into adulthood. She wanted parishioners at St. Adalbert to have that same experience. 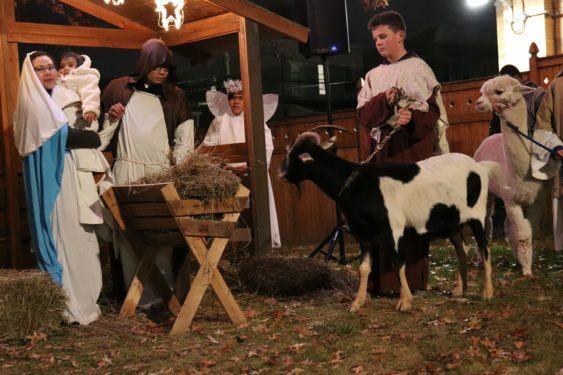 It is also why the Truskolascy family rushed to make it for the Christmas play after a long day of Polish school and sports. 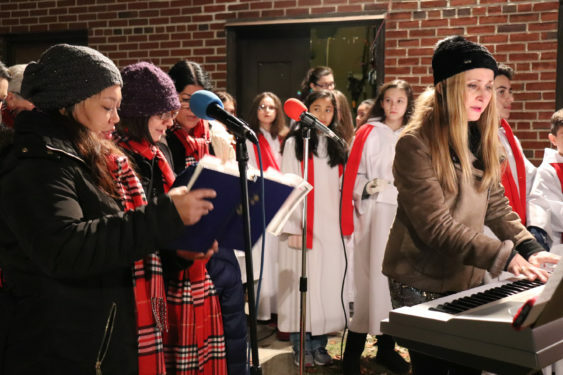 They wanted their 4-year-old daughter Kinga, and their son Krystian, 12, to experience the countercultural meaning of Christmas. 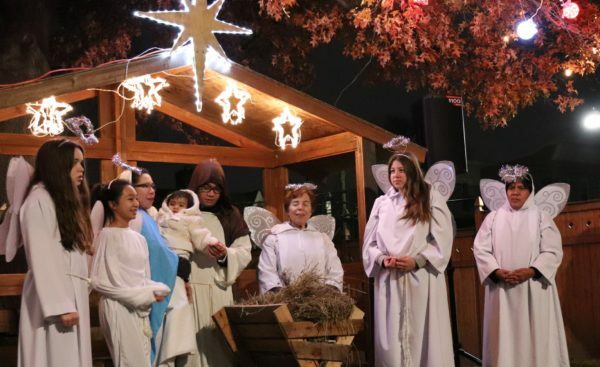 The mother of the family, Marta, said television, for example, gives an image of Christmas that is about material gifts and taking out lines of credit. 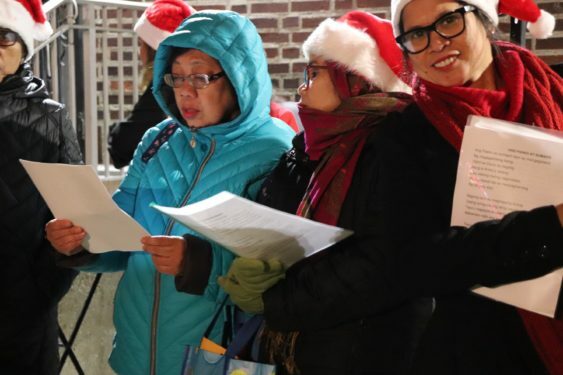 St. Adalbert and receives the message of Christmas there, it is important for them to come to together as a family to parish events to prepare for the holy season. 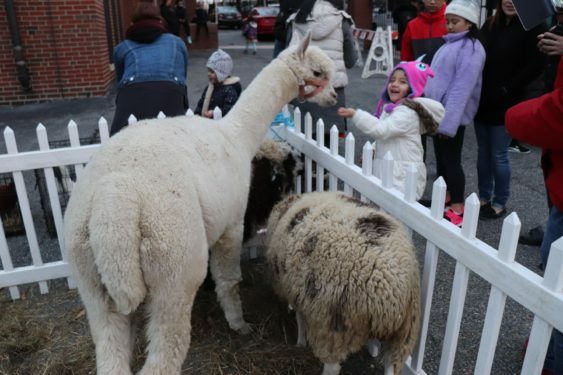 The animals that took part in the reenactment of the Birth of the Lord were also present for an hour during a parish pop-up petting zoo earlier in the day. 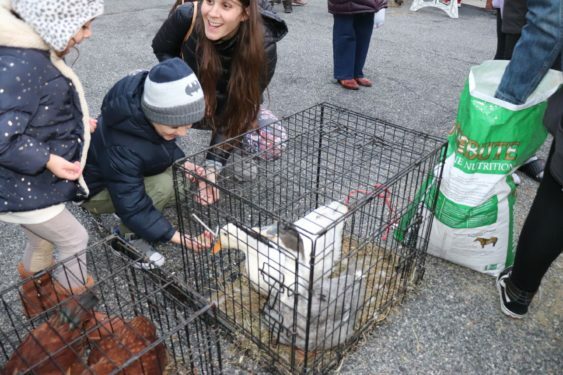 Children and adults were invited to feed and pet the sheep, alpaca, donkeys, goats, ducks and chickens. 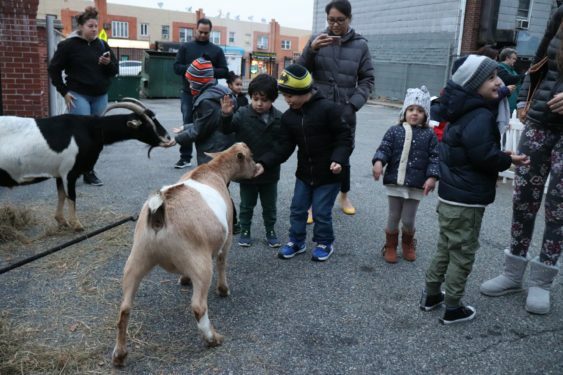 Although many of the younger children were scared at first, they soon became familiar with the animals and ran to get them more food. 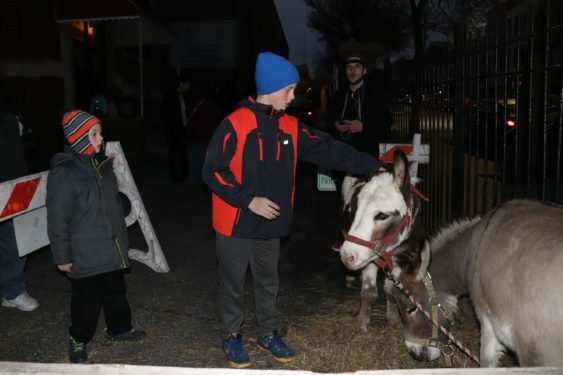 Jaclyn Smith, from Pony Express Entertainment, said the parish asked her company to bring the animals in for a longer time span after the children seemed fascinated with them the first year. 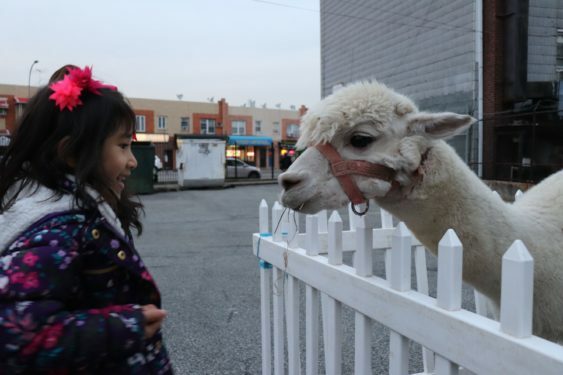 She said she was happy to accommodate the request because it ties with the mission of her company, to introduce city children to farm animals. 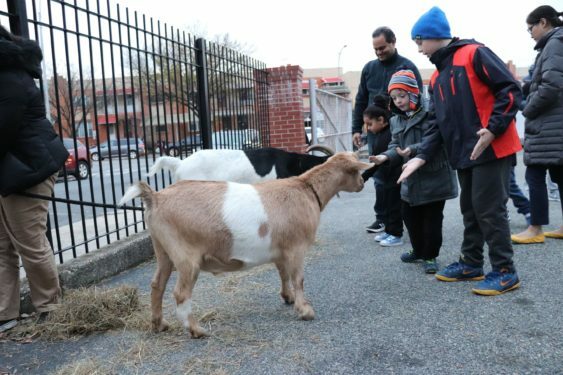 She said the animals bring joy to the children and foster a sense of respect and understanding. 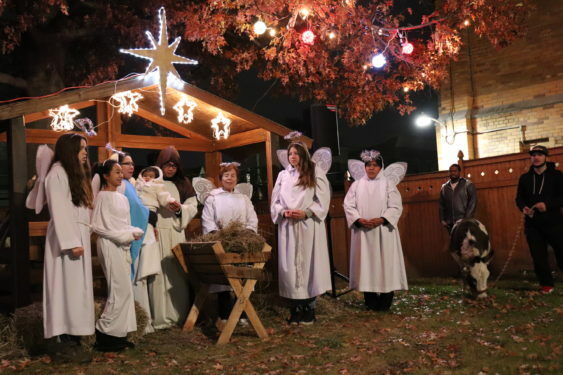 I remember growing up in St. Adalbert parish decades ago, and this was something the Franciscan Friars organizes in their backyard every Christmas season. Glad to see the tradition continues!